Polka Dot Portofino Shirt – Y’all know how much I love the Portofino shirts from Express right? Well you should cos I’m wearing them in TWP#9, TWP#17 and TWP#19. It’s a more subtle look today though with little hints peeking out under the sweater. Black Sweater – A cheapie from Tempt but one which is well worn. I would have preferred a V neck if I’m honest but I don’t have one so this is a reasonable substitute. Chevron Heels – It’s my first time wearing these and I have to admit I didn’t last the whole day. There were a little big and a little high. They looked great though while it lasted right? Coach Bag – So this one is a compromise … If I had a houndstooth clutch I would have really loved to wear it today and take mixing my prints to the next level but I don’t have one and I’m really trying not to buy things I won’t get a lot of use out of at the moment so the old faithful Coach will just have to do! Also featured in TWP#13. Pearl Choker – Also worn in TWP#6. I know this is an older post, but this is a great outfit! 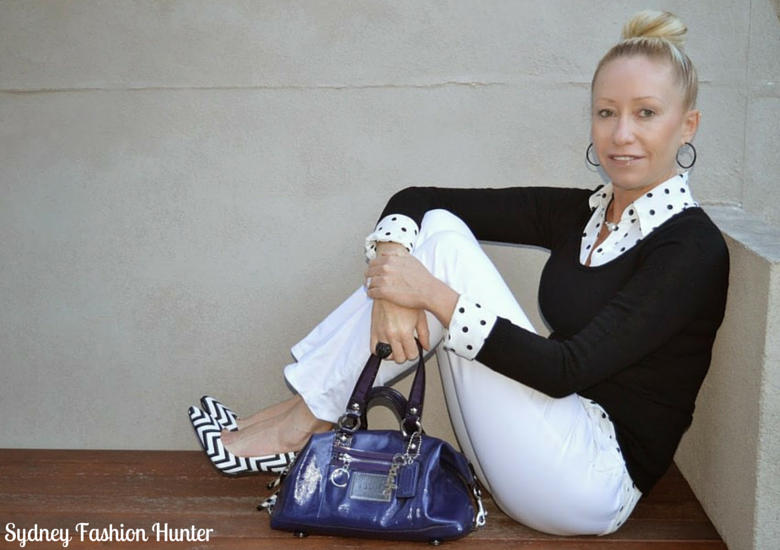 Love the black and white mix of color and your pattern mixing is spot on!! Thanks so much Debbie! Truly appreciate it ?